Are no-kill proponents out of touch? Or shelters lazy? For starters: I’m not against the no kill movement. I’m certainly not pro-kill. If there’s any confusion as to whether I think taking the life of a living, breathing animal is an ok solution, simply because there’s no place to put him, let me be clear. I abhor it. It’s just that I hate acute, unrelenting suffering even more. Two weeks ago I posted an editorial recounting a conversation with a visitor to the shelter where I volunteer. The woman wanted to know why we didn’t send our excess animals to no-kill shelters. Many readers wrote in to say they understood the complexity and magnitude of the overpopulation issue. Others suggested that stopping the killing is the only humane approach. So I decided it was time for a follow-up entry in which I could address some of those comments. Aren’t animal shelters part of society? And doesn’t society decide how the shelters are run and with how much money? And aren’t they the same shelters that are so under-resourced and overcrowded that society is loathe to visit — and thus adopt from them — because they’re so depressing? Oh wait, she means individuals in society will care for the animals. Ok. Do we mandate that every home in the community take in a shelter dog and cat? Do we then hire government officials to make sure these homes — regardless of whether they have the means and desire to care for the these animals — are providing food and water, medical care, mental and physical exercise, and relief from the extreme cold and heat? Do we ask that those individuals who can’t care for their animals surrender them to shelters? Hmm. That leads us right back to… oh, never mind. As for the homeless adults and children society is looking after, I’m not so sure that’s working either. And those programs have a heck of a lot more of society’s funding and support behind them. While the purpose of this piece is not to defend any one particular shelter or to convince you that euthanasia is a great choice, I’ll let readers know this. The Espanola Valley shelter, where I was confronted, does have a Trap-Neuter-Return program in place. We also have an extensive foster network we rely on, very low cost spay-neuter services, and frequent off-site adoption fairs — all part of the no kill philosophy. My friend Martha reminds me that in order to achieve no kill, each factor of its equation must be put into practice, from working closely with rescue groups to creating pet retention programs; this requires the efforts of a community. The issue can’t be solved by just a few committed members of society. In other words, it takes a majority of individuals, the support of neighboring counties, and backing at every level of government to turn this around — more than a village. I’m not saying it can’t be done. I’m saying that placing the burden primarily on under-resourced shelters is a difficult way to go about it. Two readers commented that their local shelters are successfully no kill — and mentioned them by name. I think one of the biggest misperceptions about no-kill shelters is that they care for a large number of animals. Most no-kill shelters have a limited admissions policy. In other words, they don’t accept every animal who arrives at their door. Of those they turn away, some animals wind up at open-admissions shelters; others are simply abandoned. I checked out the websites for the shelters the readers mentioned. Both are “limited-admissions” facilities. According to the no-kill movement, shelters must be both open admissions and claim a 90% live release rate in order to qualify as no kill. Reno, Nevada, is the city most often cited as successfully no kill — few other areas have been able to maintain that status for as long as they have. But just to put the numbers in perspective: Espanola (where I volunteer) has a population of about 10,000 people. The shelter took in 4000 animals last year — that’s 1 in 2.3 animals per human. In Reno, the human population is 219,636; their yearly animal intake is about 15,855 – that’s 1 in 14 animals per humans. Per capita, Espanola takes in 6 times as many animals. That’s not to say we should give up. But we have to remain realistic about what it takes to succeed, knowing just how limited our resources are. How high does the number of surrendered animals have to get before it graduates from an excuse to a fact? How far must temperatures plummet before we decide not to adopt to the man who wants to keep his dog outside all winter? When do we admit that the continuous barrage of pleas to adopt is only a Band-Aid? At what point do we ask our neighbor — who doesn’t have a dog, but does have three kids in public school — to make funding the animal shelter a priority? To be clear: I’m not anti no kill. I badly want it to work. But until there’s an answer with more sense than “society will take care of them,” I remain pessimistic. I know that there are many many people who provide their animals with the life they deserve. But I see just as many who don’t. 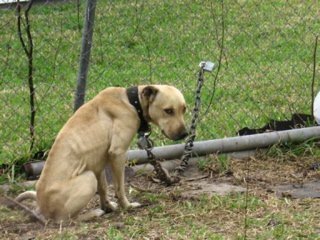 And should something happen to me, I don’t want my sensitive, short-haired, highly social dog “living” cold and alone on the end of a chain.